This traditional Buddhist text, composed by Thogme Zangpo, contains essential and practical instructions for the development of compassion and its application in to daily life, how to turn the difficulties of life into training for spiritual growth. The basis for the text is the practice of Chenrezig, the embodiment of compassion. you have true compassion extending to all. To those who in all of the comings and goings have seen that all things are inherently void, and thus can devote both their time and their efforts with one aim in mind – "Let me benefit all!" To such foremost Gurus and you, Lokeśvara, all-seeing protector, with utmost respect, I bow down before you in constant obeisance, and turn to your service my thoughts, words and deeds. The fully Enlightened Victorious Buddhas, from whom all true pleasure and benefits come, have reached their attainment by following Dharma and leading their lives through this highest of paths. To live by the Dharma depends on full knowledge of how we must practice and what we must do, and so I'll attempt here a brief explanation of what is the practice of all Buddhas' Sons. let's work night and day without veering off course to take 'cross the ocean and free from Saṁsāra not only ourselves but all others as well. First listen, think hard, then do much meditation – the Sons of the Buddhas all practice this way. (2) Remaining too long in one place our attraction to loved ones upsets us, we're tossed in its wake. The flames of our anger toward those who annoy us consume what good merit we've gained in the past. The darkness of closed-minded thought dims our outlook, we lose vivid sight of what's right and what's wrong. We must give up our home and set forth from our country – the Sons of the Buddhas all practice this way. (3) Withdrawing ourselves from the things that excite us, our mental disturbances slowly decline. Ridding our minds of directionless wandering, attention on virtue will surely increase. As wisdom gets clearer, the world comes in focus, our confidence grows in the Dharma we've learned. We must live by ourselves far away in seclusion – the Sons of the Buddhas all practice this way. (4) No matter how long we've been living together, good friends and relations must someday depart. Our wealth and possessions collected with effort are left far behind at the end of our lives. Our mind's but a guest in our body's great guest house, one day it must vacate and travel beyond. We must cast away thoughts just concerning this lifetime – the Sons of the Buddhas all practice this way. (5) From staying together with friends who misguide us, our hatred, desires, and ignorance grow. We're left little time to continue our studies; we don't think of Dharma; we meditate less. Our love and compassion for all sentient beings are lost and forgotten while under their sway. We must sever our ties with misleading companions – the Sons of the Buddhas all practice this way. (6) Entrusting ourselves to the hands of a Guru and completely relying for guidance on him, our competence both in the scriptures and practice will expand like the moon growing full and complete. We'll solve all our problems, dispel our delusions, by placing our confidence on him with trust. We must cherish our Guru far more than our body – the Sons of the Buddhas all practice this way. (7) The gods of this world are not free yet from sorrow, they're caught in Saṁsāra, some time they must fall. If they're bound as we are, how can they protect us? How can someone in prison free anyone else? But Buddha, his teachings and those who live by them are free to give comfort – they'll not let us down. We must go to the 3 Jewels of Refuge for shelter – the Sons of the Buddhas all practice this way. (8) The Buddha has said that the grief past endurance of creatures whose lives contain nothing but pain is misfortunate fruit of the wrongs they've committed against other beings in lifetimes gone by. Not wishing to suffer from horrible torment, not flinching if even our lives are at stake, we must turn from all actions that harm other beings – the Sons of the Buddhas all practice this way. (9) Like the dew that remains for a moment or two on the tips of the grass and then melts with the dawn, the pleasures we find in the course of our lifetimes last only an instant, they cannot endure; while the freedom we gain when becoming a Buddha is a blissful attainment not subject to change. We must aim all our efforts to this high achievement – the Sons of the Buddhas all practice this way. (10) In all of our lifetimes, in each incarnation, we've been cared for by others with motherly love. While these mothers of ours are still lost in Saṁsāra, how cruel to ignore them and free just ourselves! To save other beings, though countless in number, to free from their sorrows these mothers of ours, produce Bodhichitta, the wish to be Buddha – the Sons of the Buddhas all practice this way. (11) All of our sufferings, without an exception, derive from the wish to please only ourselves; while the thoughts and the actions that benefit others conceive and give birth to supreme Buddhahood. And so, in exchange for our selfish desires and shameful neglect of our suffering kin, replace thoughts of self with concern for all others – the Sons of the Buddhas all practice this way. then out of compassion and with no attachment, to him we must dedicate all of our prayers, may he have wealth and our body and merits – the Sons of the Buddhas all practice this way. then mercifully wishing for him not to suffer from further misfortune because of his state, we must take on ourselves the effects of his actions – the Sons of the Buddhas all practice this way. yet out of our wish for the one who's maligned us to conquer his troubles and gain peace of mind, we must practice all virtues and treat him with kindness – the sons of the Buddhas all practice this way. then not getting angry nor being defensive, just listening in silence and heeding his words, we must bow in respect to this man as our teacher – the Sons of the Buddhas all practice this way. then seeing these acts as a terrible sickness befallen our child and affecting his mind, we must treat him with even more love and affection – the Sons of the Buddhas all practice this way. then seeing that they are like Gurus to teach us to be always humble and conquer our pride, we must treat them with honour and place them above us – the Sons of the Buddhas all practice this way. then accepting ourselves all these hardships that others would have to have suffered from wrongs they had done, we must never lose courage to take pain from others – the Sons of the Buddhas all practice this way. yet seeing full well that this fruit of Saṁsāra, though fortunate, still has no essence at all, we must cast out what pride we might have in these glories – the Sons of the Buddhas all practice this way. (20) If anger that dwells in our hearts lies neglected and turning instead to our external foes, we try to destroy them and even kill thousands, then thousands of others will plague us still more. So seeing this action is not a solution, let's muster the forces of mercy and love; turn inwards and tame the wild flow of our mind-stream – the Sons of the Buddhas all practice this way. (21) Indulging in objects our senses run after and drinking salt water are one and the same: the more we partake, for our own satisfaction, the more our desires and thirst for them grow. Thus when we conceive a compulsive attraction toward whatever object our senses desire, abandon it quickly without hesitation – the Sons of the Buddhas all practice this way. (22) Whatever appears to be truly existent is just what our mind in delusion creates; this mind of ours also is, from the beginning, devoid of an essence inherently real. Then seeing that Truth is beyond the conceptions we have of the known and the knower as well, dispel the belief in inherent existence – the Sons of the Buddhas all practice this way. though both of them have such a lovely appearance, there's nothing substantial behind this facade. Abandon the drives of compulsive attraction – the Sons of the Buddhas all practice this way. (24) The various ills in our life that we suffer resemble the death of our child in a dream; to hold as the truth what is merely illusion is needless exhaustion of body and mind. For this very reason, when faced with unpleasant conditions that normally cause us much grief, approach them as if they were only illusion – the Sons of the Buddhas all practice this way. (25) The beings who strive to be fully Enlightened would give up their bodies pursuing this aim; with this high example, what need is the mention of gifts we should make of the objects we have. Without any hopes of return for our kindness, or thinking about all the merit we gain, engage in the practice of generous giving – the Sons of the Buddhas all practice this way. (26) If lacking strict moral control of our conduct we haven't been able to reach our own goals, how can we fulfil all the wishes of others? Undisciplined effort is surely absurd! We have to renounce first attachment to pleasures, which binds us so tightly to Saṁsāra's wheel, then protect all our vows of sworn moral behaviour – the Sons of the Buddhas all practice this way. (27) For all Bodhisattvas with minds set on merit who wish to amass a great store of good deeds, encounters with those causing harm and destruction which test their commitment are mines of great wealth. For this very reason, abandon resentment and anger directed toward those who do harm; perfect meditation on patient endurance – the Sons of the Buddhas all practice this way. then how much more energy must be expended by those of us working for everyone's sake; Enlightenment calls for the most perseverance – the Sons of the Buddhas all practice this way. (29) Higher insight that penetrates right to the essence, revealing the true way in which things exist, can only root out our emotional problems if mental quiescence is laid as its base. So exceeding the four formless states of absorption we must work to achieve single-minded control and the full concentration of deep meditation – the Sons of the Buddhas all practice this way. (30) Perfection of charity, patience, and morals, absorption and effort just isn't enough; without the Perfection of Wisdom these five are unable to bring us to full Buddhahood. With the methods of pure Bodhichitta develop the wisdom to see that the actor, the act, and the acted upon lack inherent existence – the Sons of the Buddhas all practice this way. (31) Without making efforts to analyse clearly delusions we have and mistakes we commit, then even though outwardly practicing Dharma, we still may perform many non-Dharma deeds. For this very reason, let's try to examine mistakes and delusions and faults we possess, and afterwards try to remove them completely – the Sons of the Buddhas all practice this way. (32) While speaking of others, the force of delusion may cause us to talk of the flaws they possess; if those we find fault in should be Bodhisattvas, our own reputation will suffer instead. So don't run the risk of disparaging others who've entered upon Mahāyāna’s great path; only the faults that we have should we mention – the Sons of the Buddhas all practice this way. (33) Domestic disputes with our friends and relations, to gain their respect or the things we feel due, will leave us unable to listen to Dharma, unable to study or meditate well. Since danger is found in the homes of our patrons, as well as in those of our family and friends, abandon attachment we have to these households – the Sons of the Buddhas all practice this way. (34) The words of abuse that we utter in anger cause others much pain by disturbing their minds; and we who are striving to be Bodhisattvas will find that our practice will surely decline. So seeing the faults that arise from harsh language, which those who must hear find unpleasant to bear, abandon abuse that's directed toward others – the Sons of the Buddhas all practice this way. (35) Defiled types of actions will soon become habits as we grow accustomed to base states of mind; a great deal of effort will then be required for the force of opponents to counter these stains. So armed with the weapons alertness and memory, attack such defilements as lust on first sight; remove these obstructions that hinder our progress – the Sons of the Buddhas all practice this way. (36) In short, then, whatever we do in whatever condition or circumstance we might confront should be done with the force of complete self-awareness, which comprehends fully the state of our mind. Then always possessing alertness and memory, which keep us in focus and ready to serve, we must work for the welfare of all sentient beings – the Sons of the Buddhas all practice this way. we must dedicate purely for them to be Buddhas, with wisdom that sees that both they and ourselves as well as this merit all lack true existence – the Sons of the Buddhas all practice this way. 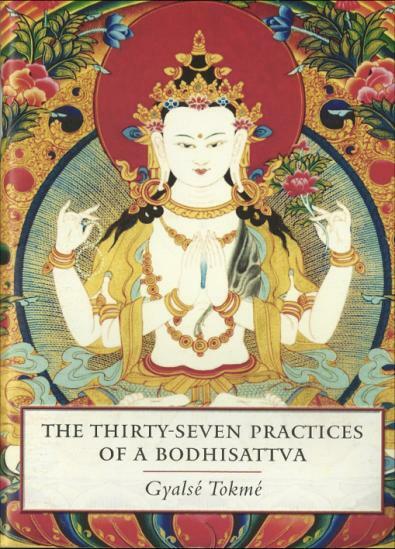 I've written this work on the practices numbering thirty and seven of all Buddhas' Sons to benefit those who desire to follow the path that all Sons of the Buddhas must tread. but as I've relied on the words of the sūtras and all that my most holy Gurus have taught, I'm certain that this is without any errors; this truly is what Buddhas' Sons have all done. However, because the extent and the depth of the great waves of conduct of all Buddhas' Sons are hard to be fathomed by someone of limited powers of intellect as is myself, there're bound to be faults, contradictions in meaning, disjointed connections and many such flaws; so most holy Gurus, I beg your indulgence, be patient with all the shortcomings I have. may all sentient beings receiving the merit amassed by the effort I've made in this work soon reach your attainment, O great Lokeśvara, all-seeing protector with love for us all. for both his own benefit and for the sake of all others.